WASHINGTON — Using NASA’s Hubble Space Telescope, astronomers have uncovered a previously unseen population of seven primitive galaxies that formed more than 13 billion years ago, when the universe was less than 4 percent of its present age. 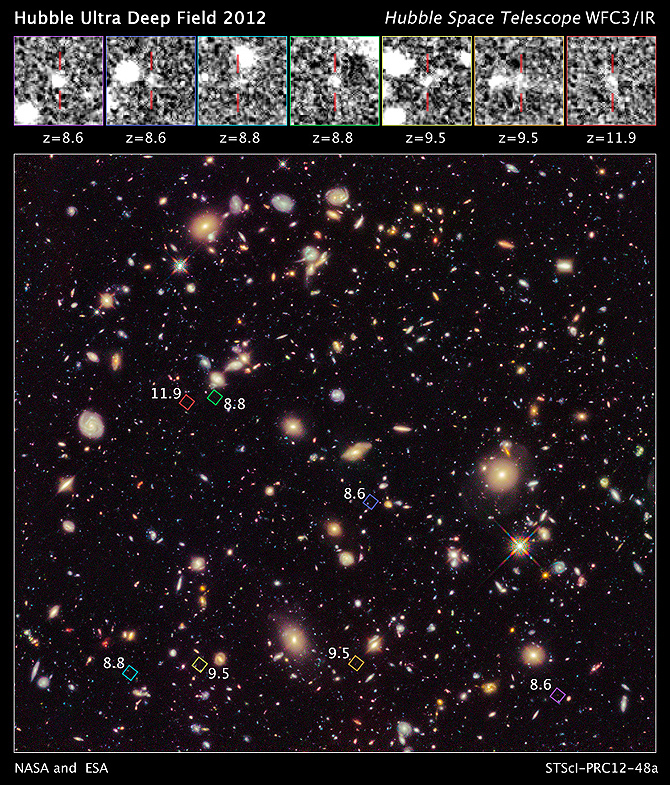 The deepest images to date from Hubble yield the first statistically robust sample of galaxies that tells how abundant they were close to the era when galaxies first formed. Astronomers study the distant universe in near-infrared light because the expansion of space stretches ultraviolet and visible light from galaxies into infrared wavelengths, a phenomenon called “redshift.” The more distant a galaxy, the higher its redshift. The team estimated the galaxy distances by studying their colors through a carefully chosen set of four filters at specific near-infrared wavelengths. “We added one filter, and undertook much deeper exposures in some filters than in earlier work, in order to convincingly reject the possibility that some of our galaxies might be foreground objects,” said team member James Dunlop of the Institute for Astronomy at the University of Edinburgh in Scotland. Astronomers have long debated whether hot stars in such early galaxies could have provided enough radiation to warm the cold hydrogen that formed soon after the big bang. This process, called “re-ionization,” is thought to have occurred 200 million to 1 billion years after the birth of the universe. This process made the universe transparent to light, allowing astronomers to look far back into time. The galaxies in the new study are seen in this early epoch. The team’s finding on the distant galaxy census has been accepted for publication in The Astrophysical Journal Letters.